Since the great financial crisis, extremely low interest rates allowed the total number of highly speculative corporate bonds, or “junk bonds,” to rise 58% — a record high. It's not that the price is different, per se. When gold crashed on Monday, dragging market prices down to a low of $1321.50 an ounce from levels around $1560 only days before, holders of physical gold saw the value of their holdings decline as well. However, we've seen a lot of claims that somehow there's a difference between the market for physical gold (people buying gold bars or gold coins) and that for "paper" gold (which refers to gold futures traded on the COMEX or shares of GLD, the gold ETF). 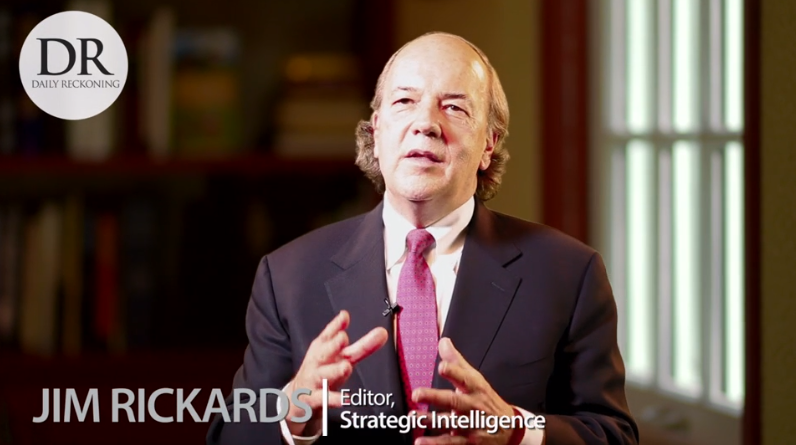 Jim Rickards, a prominent gold bull and author of the book Currency Wars, told Business Insider that the disconnect between the two markets evidenced by the crash on Monday is not one of price, but "in terms of behavior, in terms of people's responses to market developments." Rickards uses a classic "weak hands, strong hands" analogy to compare physical gold buyers and paper gold buyers. According to Rickards, the "weak hands" in the gold market were the over-leveraged buyers of gold futures and ETFs that caused prices to plummet in the recent sell-off. "If you're an un-levered buyer of bullion - say, 10% of your investable assets - you kind of watched the headlines and watched the ticker [as gold crashed] on Thursday, Friday, and Monday, but it didn't affect you," says Rickards. Gold ownership is now divided between strong hands and weak hands. The strong hands are Russia, China, some of the other central banks, and anybody else who is buying gold for cash in physical form, without leverage. The weak hands are retail jumping into GLD, at a top, using margin, futures players, and people who don't really understand gold. There are a lot of trend followers out there who started following gold on a trend basis, but didn't really understand anything about gold, or how it works, etc. The hedge funds turn out to be weak hands, not strong hands. The reason is they've got redemptions. Hedge funds don't have permanent capital. They may have monthly redemptions, or quarterly redemptions, or one-year lockups, or whatever it is, but it's not permanent capital. Will the Argentina & Venezuela Crisis be Contained, Or Will Contagion Spread? "Ukraine, South Africa and Chile are also highly vulnerable to a run on their reserves and a default on their external dollar-denominated debt. The only issue now is whether the new crisis will be contained to Argentina and Venezuela or whether contagion will take over and ignite a global financial crisis worse than 2008. It has been 20 years since the last EM debt crisis and 10 years since the last global financial crisis. This new crisis could take a year to spread, so it’s not too late for investors to take precautions, but the time to start is now. The Fed’s path of rate hikes and balance sheet reductions since December 2015 has reinvigorated the U.S. dollar, as I explained above. A stronger dollar means weaker EM currencies in general. Again, that’s exactly what we’ve seen lately. Right now, EM currencies are in free fall against the dollar. Now that the Federal Reserve raised rates again last month, is the bottom in for emerging-market currencies? And is the top in for the dollar?" The dollar constitutes about 60% of global reserves, 80% of global payments and almost 100% of global oil transactions. So the dollar’s strength or weakness can have an enormous impact on global markets. Using the Fed’s broad real trade-weighted dollar index (my favorite foreign exchange metric, much better than DXY), the dollar hit an all-time high in March 1985 (128.4) and hit an all-time low in July 2011 (80.3). Right now, the index is 95.2, below the middle of the 35-year range. But what matters most to trading partners and international debtors is not the level but the trend. The dollar is up 12.5% in the past four years on the Fed’s index, and that’s bad news for emerging-markets (EM) debtors who borrowed in dollars and now have to dig into dwindling foreign exchange reserves to pay back debts that are much more onerous because of the dollar’s strength. And EM lending has been proceeding at a record pace. Actually, the Fed’s broad index understates the problem because it includes the Chinese yuan, where the dollar has been stable, and the euro, where the dollar has weakened until very recently. When the focus is put on specific EM currencies, the dollar’s appreciation in some cases is 100% or more. Much of this dollar appreciation has been driven by the U.S. Federal Reserve’s policy of raising interest rates and tightening monetary conditions with balance sheet reductions. Meanwhile, Europe and Japan have continued easy-money policies while the U.K., Australia and others have remained neutral. The U.S. looks like the most desirable destination for hot money right now because of interest rate differentials. And that is having far-reaching consequences on EM economies. Jim Rickards joined Kitco News and Daniela Cambone to discuss the latest news and analysis from gold markets, geopolitics and even bitcoin. The Wall Street veteran took on the bigger picture facing metals investors and what could be just around the corner in a bubbling market. "So, I would say two things about the monetary collapse. No. 1, it could happen very suddenly — and likely it will — and we won’t see it coming, so investors need to prepare now. You’ll find that the mint stops shipping it. That your local dealer has run out so there’ll still be a price somewhere. You’ll be able to watch the price on television, but you won’t actually be able to get the gold. It’ll be too late." The two questions I’m asked most frequently about the monetary collapse are: what’s the event that’s going to take down the system and when is it going to happen? It’s not a linear function. It’s an exponential function. What that means is that when you triple the system, you don’t triple the risk. You increase risk by ten or a hundred times. That’s what we’re doing. We’re out there making the San Andreas Fault bigger so we can have even bigger earthquakes in the future. That’s exactly what’s going on.